How Do I Make Web-Based Mail My Default? Skicrazer asked the Web Browsing and Email forum what to change so that clicking a mailto link would bring up a Web-based mail account. I find it amazing that this isn't simply part of Windows by now. The operating system has had a default mail client setting for a very long time, and Web-based email isn't exactly a new idea, either. Yet Microsoft has never added a way to make that mail client a URL rather than a program. So we have to use third-party software to work around Windows' limitations. In this post, I'm going to concentrate on browser-based fixes. These work for the mailto links on web pages (such as answer@pcworld.com), but don't help if you want to send mail from Windows Explorer, Word, or other applications. I'll continue with those in Monday's post. Firefox has one such tool built in--at least if you're using Gmail or Yahoo Mail. Select Tools, then Options. Click the Applications tab. Select mailto, pull down the menu, and select Use Gmail or Use Yahoo! Mail. Chrome users should go to the Chrome web store and search for mailto. You'll find plenty of Mail plug-ins for specific services. 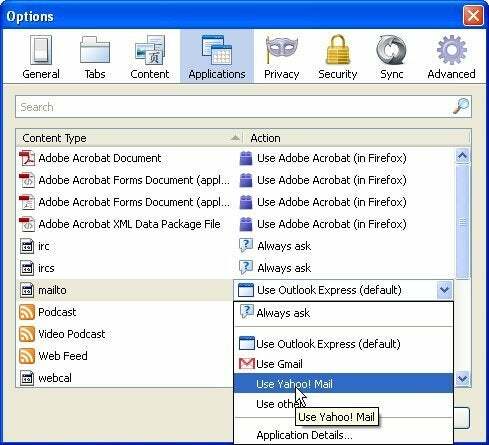 You'll also find the generic Mailto, which supports AOL, Fastmail, Gmail, Hotmail, Yahoo, Zoho, or, with a bit of work, other services. I know of no such add-ins for Internet Explorer. However, the two Gmail-specific solutions I discuss below, plus the one on Monday, will work with Microsoft's browser. If you use Gmail, Google offers two free programs, either of which will handle mailto links appropriately: Gmail Notifier and the Google Toolbar. Both of these have other features and come with other baggage, so you may or may not want them. If you decide to install the Notifier, make sure to leave the Use for outgoing mail option checked. 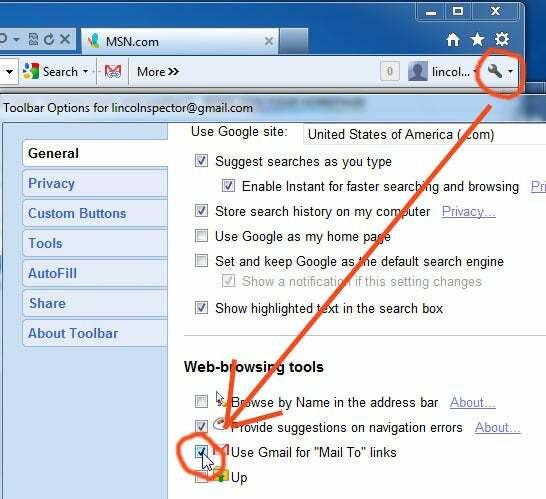 If you go with the Toolbar, click the Tool icon, and in the General tab, check Use Gmail for "Mail To" links. Stay tuned for next week's exciting conclusion. You might also want to read the original forum discussion.